This week’s recipe is a quick one, but a good one! Much as I love spending a lot of time in the kitchen playing with different ingredients and coming up with new concoctions, sometimes it’s the simplest recipes that do the trick. 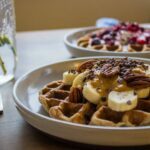 These 3 Ingredient Oatmeal Waffles do just that: chewy, satisfying and delicious, they’re the ultimate comfort food without all the rubbish thrown in. Made simply from oats, bananas and plant-based milk (plus any extras you wish to add), they’re a great option for breakfasts or just as a snack. You could even add your favourite plant-based protein powder to the mix to make them extra-filling! Don’t have a waffle iron? No problem. This mixture works perfectly as waffles or pancakes, so feel free to pour it into a frying pan and make some thick pancakes instead. 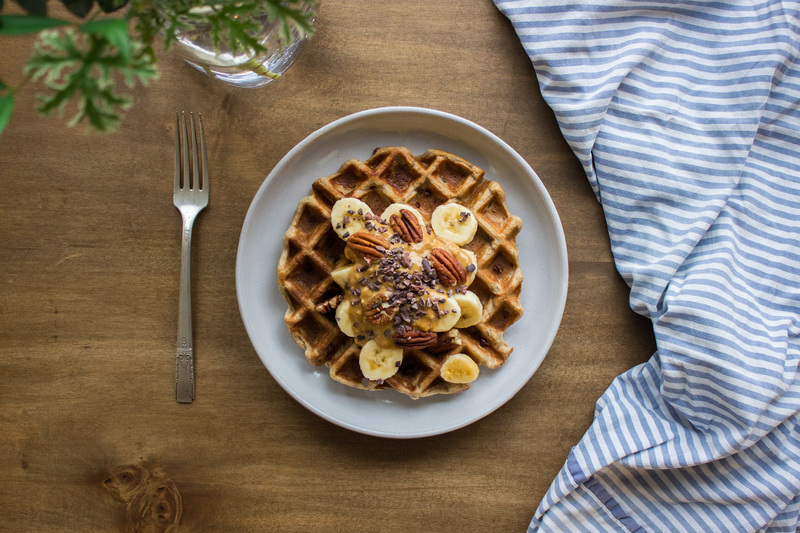 For a hearty, delicious breakfast, try these 3 ingredient oatmeal waffles. Using only oats, bananas and plant-based milk, they're vegan and gluten-free too! Switch your waffle iron on and allow it to reach cooking temperature. Blend the oats in a high power blender for 20 seconds until a flour forms. Add in the banana and milk (and any other optional add-ins you like) and blend for another 20 seconds on high, until the mixture is smooth and lump-free. The mixture should be quite thick at this point. Using kitchen towel, coat all cooking surface of the waffle iron to help avoid sticking. Spoon half the mixture evenly into the iron, ensuring it spreads evenly across the bottom surface. Close the lid and leave to cook for 7 minutes (until the steam coming out reduces). Open the iron, and leave for 20 seconds before gently removing the waffle with a flat knife. 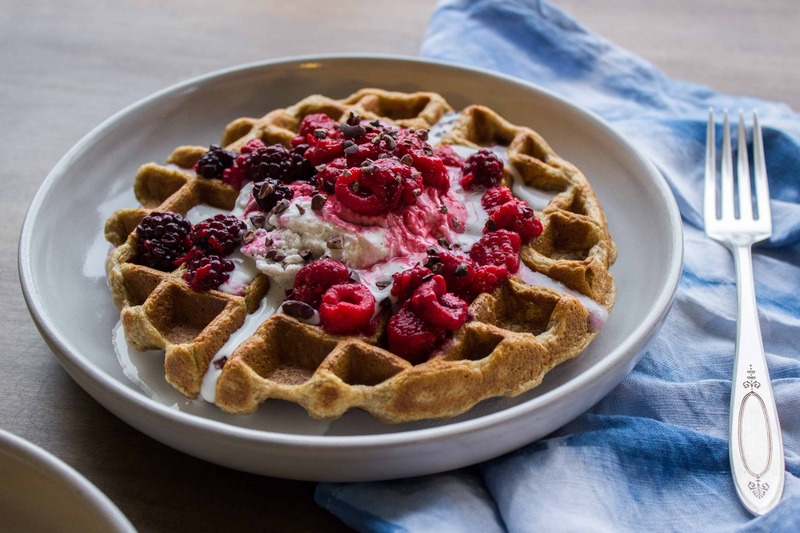 Repeat the process for the second waffle, and store the first on a plate in a warm oven until ready to eat. 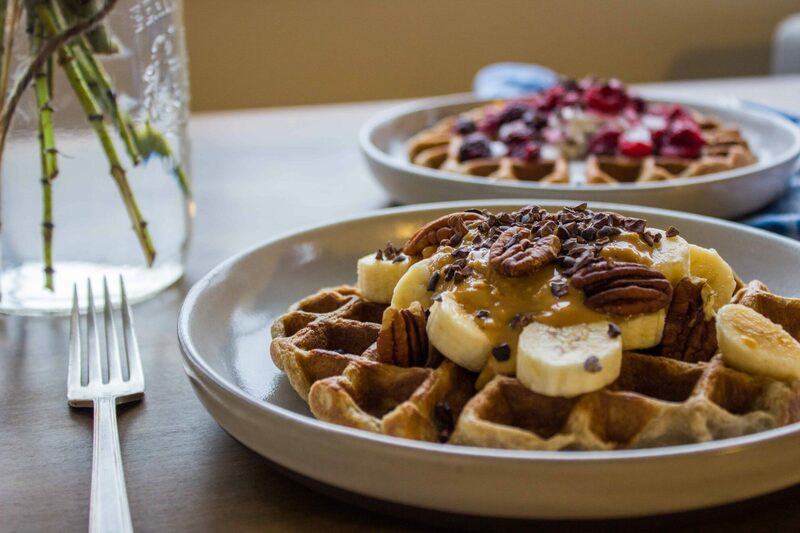 Top the oatmeal waffles with maple syrup, coconut cream, bananas, berries, cacao and/or cinnamon, or get creative and use your own favourite toppings. Enjoy! For the DIY coconut cream, see my recipe here.